Usually referred to as wireless display, Samsung Galaxy S4 screen mirroring is a feature that duplicates the display in your GS4 on a television or other bigger screens for better, bigger view. When the screen mirroring feature is turned on, your Galaxy S4 will function like a remote control for your television. With this feature enabled, you can watch any video, play games, view photos saved in your GS4 handset on the television and share them with the members of your family or friends during some important gatherings. 1. Go to the Settings Menu on your phone. 2. Select Connections to view available options. 3. Touch to select Screen Mirroring. 4. To turn it on (enable), simply drag it to right. *** To turn it off (disable), just drag it left. 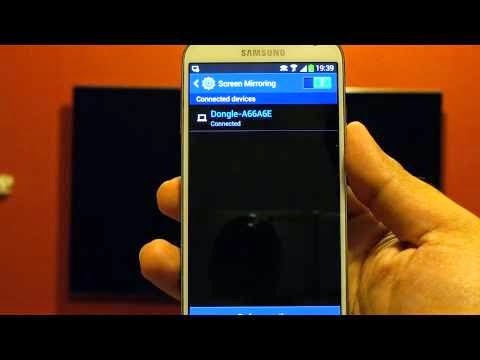 Once screen mirroring is turned on, the GS4 device will then start to scan for available devices that support Miracast within the range. Miracast refers to the technology behind the screen mirroring feature on Samsung Galaxy S4 devices. Such technology allows a portable device or computer to send securely via peer-to-peer WiFi direct connection up to 1080p HD video with 5.1 surround sound to any devices that support Miracast. Android officially supports Miracast for Jelly Bean 4.2 and later versions. 5. Tap on the device you wish to connect to the GS4 and display contents to. 6. You will be prompted with on-screen instructions. Just follow these instructions to complete screen mirroring set up on both devices. In order to use the Galaxy S4 screen mirroring, you need to have another device that is Miracast-supported, such as a Miracast-supported television or a Miracast-supported HDMI dongle (regardless of brand and vendor). What If Your Television does not support Miracast? In case your television does not support Miracast and you want to use it to display or mirror contents from your Galaxy S4 smartphone, you need to secure an HDMI port for screen mirroring to work. · HDMI adapter, which supports Miracast - Prefer to use high-quality adapters to avoid latency or lagging issues. Among the most recommended brand is Netgear Push2TV Wireless Display HDMI Adapter with Miracast. This adapter is known to work well with Samsung Galaxy S4 screen mirroring. · Samsung AllShare Cast Hub – It’s exclusively designed for use on Samsung devices, and works great for GS4 screen mirroring. No configurations needed. · Samsung HomeSync - Refers to a personal cloud (1TB) embedded with many features including screen mirroring. HomeSync is recommended for those who need personal storage cloud to store and share GS4 contents (videos, music, and photos). It can also be used as a media player for your television. Note: Not all Galaxy smartphones and tablets are supported by HomeSync.